NEWS OUTLETS AND websites in Ireland around the world have been taken in by a story from an Irish satirical website about a North Korean mission to the sun. The story, posted on Waterford Whispers on Monday, concerns Korean astronaut Hung Il Gong’s 18-hour round trip to the dark side of the star. “We are very delighted to announce a successful mission to put a man on the sun.” a North Korean central news anchor man said on a live broadcast earlier. Amongst the outlets taken in by the tale were conservative news site the Canada Free Press, technology site Tweaktown and Arizona radio station K-TAR. It should be noted that the sites aren’t necessarily falling for what’s described in the article as the ‘official state news agency’ line in the ‘report’ — rather, they’re reporting on the fact that the report was reported by the official North Korean state news agency. Speaking to TheJournal.ie, Waterford Whispers owner Colm Williamson said he was surprised that the story had been picked up worldwide in such a manner. “The North Koreans are noted for their propaganda so that’s what we were satirising — the ridiculous nature of their propoganda,” Williamson said. There’s been a huge spike in traffic to the site since the story was posted on Tuesday, and Williamson’s paid tribute to his webmaster Alan McCabe for keeping them online amid a cyber-attack from “somewhere in Asia” during the week. There were attempts to hack the server that hosts the site and have the story taken down, but it remains online tonight and Williamson says they now have “a thousand links back” to the post on Waterford Whispers. 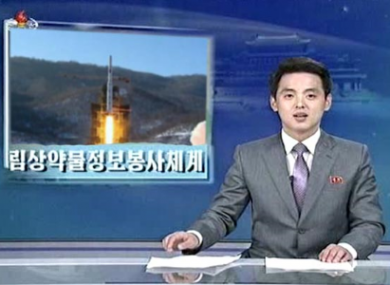 The picture of the ‘North Korean central news anchor man’ was taken from an actual state TV broadcast, but the image of the rocket was then Photoshopped in. It’s not the first time The Internet has been duped by a story from the site — its report that Michelle Obama had called Irish people ‘ugly m****f*****s’ also created a bit of a stir last year. Email “Whoops... Media outlets duped by North Korea 'rocket to the sun' story”. Feedback on “Whoops... Media outlets duped by North Korea 'rocket to the sun' story”.